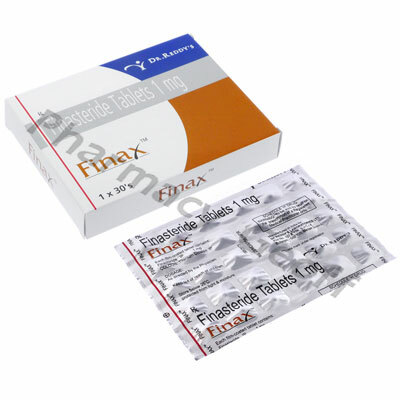 Finax tablets are used in the treatment of male pattern hair loss (androgenetic alopecia). The active ingredient finasteride is considered a 5-alpha reductase inhibitor type of medication. The medication increases hair re-growth and slow hair loss by decreasing the amount of certain natural body hormones (DHT). Some patients may also use a form of this medication to treat certain types of prostate cancer. Take one tablet of Finax orally once per day or as directed by a doctor. The medication can be taken with or without food but should be taken with plenty of water. Contact a doctor for the correct dosage as it will depend on the patient's condition and their response to the medication. Once started, it is not advised to stop the medication as it may cause the loss of the newly grown hair. The medication should not be used or handled by women as it can lead to potentially fatal reactions to an unborn child. Finax is not always suitable for all patients. Always consult your health care provider prior to using this medication if you are pregnant, breastfeeding, trying to conceive, using any other medication (prescription or non-prescription), using any herbal products or supplements, or if you have any allergies or other health problems.